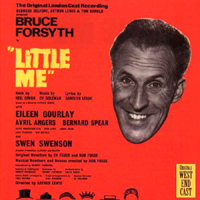 Original London Cast, 1964 (Pye/DRG) (3 / 5) A fair copy of the Broadway original, the London cast album of Little Me features Brit comedy star Bruce Forsyth in Sid Caesar’s roles, with Eileen Gourlay as Young Belle. They’re enthusiastic, to say the least — and the disc contains the dance number “Rich Kids Rag,” which the Broadway edition does not. Forsyth is a better singer than Caesar, but he can’t approach his predecessor’s performance as French cabaret star Val du Val in “Boom-Boom.” Swen Swenson is still on hand, but for some reason, this recording of “I’ve Got Your Number” lacks excitement. Still the cast is strong overall, and this is one London recording of an American musical that doesn’t suffer from slow tempi. It’s a good complement to the Broadway version, and it’s also interesting for the many changes in the lyrics for Brit audiences. — D.B. 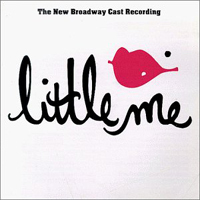 Broadway Cast, 1999 (Varèse Sarabande) (2 / 5) Little Me is one of those musicals that its creators can’t let alone. 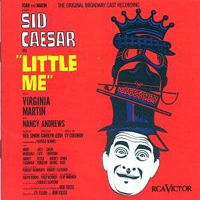 An early-’80s Broadway revisal that divided Sid Caesar’s roles between Victor Garber and James Coco was a quick flop. For the 1999 Roundabout Theatre production, Simon again rewrote his book, combing Belle and Young Belle into one role for Faith Prince. Martin Short appeared as all the men in her life. The performance in general is brassy and far too knowing; Short’s hamming is shameless (his mangled French accent in “Boom-Boom” is very unfunny), while Prince’s breathy, overemphatic singing underlines each joke with the vocal equivalent of a magic marker. On top of all that, Harold Wheeler’s new orchestrations lack the metallic exuberance of Ralph Burns’ originals. However, the recording does include the “Rich Kids Rag, and a zesty performance of “Deep Down Inside.” Also, thanks to the inclusion of some amusing dialogue sequences, we get a better sense of the show’s plot line than what may be gleaned from the two previous recordings. — D.B.